Send a beary great gift! Have A "Beary" Happy Birthday. Send a special birthday message with this adorable gift. A 14" White sparkle plush teddy bear makes this gift special. 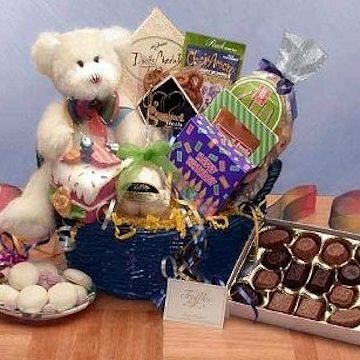 This gift includes the following: Plush teddy bear, instant raspberry ice tea, assorted sour drops with happy birthday theme box, a sliced cake candle, 9.5oz double chocolate truffles, a box of chocolate chip cookies, butter toffee pretzels and fruit candies all in a blue wicker basket! Premium gourmet food and gifts delivered nationwide.